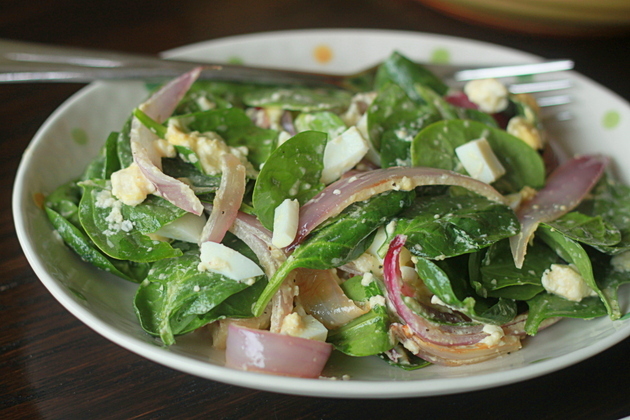 This mouth-watering vegetarian wilted spinach salad boasts baby spinach tossed with sauteed red onions, melty feta, olive oil, vinegar, and hard-boiled eggs. Meat-eaters can top theirs with bacon. 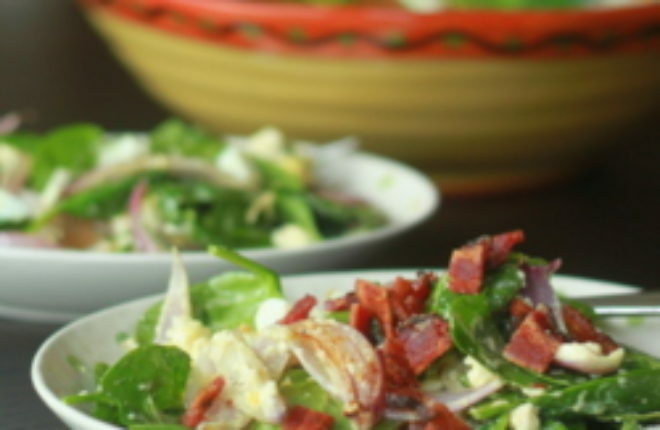 Do you remember wilted spinach salad? Or is that just something from my childhood? Spinach dressed in hot bacon drippings and vinegar until it wilts and becomes surprisingly delicious? I remember. I loved the stuff, but because I assumed the magic was in the bacon, I’ve not given it much thought since becoming a vegetarian many moons ago. But then, for some reason, thoughts of wilted spinach salad emerged, and I just had to come up with a vegetarian version. As it turns out, the magic isn’t in the bacon grease. In this version, freshly-sauteed red onions and crumbled feta cheese warmed with apple cider vinegar and olive oil help to wilt the spinach. Just a little bit. Just enough. I slightly adapted this recipe from Bon Appetit, using apple cider vinegar instead of the sherry vinegar they called for, and adding hard-boiled eggs to give it a little more variety of texture and overall heartiness. And, of course, I topped my resident carnivore’s version with bacon. I mean, it’s plenty magic without, but a little bacon finish (for those who really want it) can never hurt. Heat two tablespoons olive oil in a large skillet over medium heat-high. Add onions and saute, stirring occasionally, until softened and some bits are brown, about 7 minutes. Remove skillet from heat. Pour onions over spinach. Top with egg. Add remaining 3 tablespoons olive oil to skillet and stir in the feta cheese. Stir in unheated skillet until the cheese begins to melt, about 1 minute. Stir in the apple cider vinegar and season to taste with salt and pepper. Pour the cheese mixture over the salad. Toss thoroughly to coat and wilt the spinach slightly. Divide between four plates. Top individual servings with chopped bacon if desired. I have missed this kind of salad. Can’t wait to try your version. Sounds heavenly! 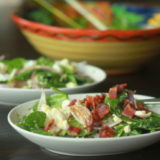 My husband always talks about a wilted lettuce salad from his childhood. I should surprise him with your spinach and feta version — which looks and sounds delicious. Thanks for sharing! Hopefully it will not disappoint. 🙂 I think one of the reasons I waited so long to try a vegetarian version is that I thought it wouldn’t compare – but it really does. Well, darn it all, I just used my spinach in another dish last night. I’ll just have to cross my fingers the next CSA box includes more, or trek to the farmer’s market this weekend, because this salad looks amazing! So glad to hear the vegetarian version is just as good! I just signed up for my first CSA! It doesn’t start until early June but I am soooo excited. It’s like, “wilted”? Really?? Not the most appetizing descriptor but it’s soooo good! I think this salad is how my parents got me to start eating veggies. I was a child who needed to be tempted with bacon… now I think I like your version better. I think the copious amounts of feta definitely help make up for the lack of bacon. 🙂 My husband and I gave our toddler a little piece of bacon the other day and she totally loved it. I must admit I was a little disappointed! This is my favorite kind of salad. I don’t eat much bacon these days but I think I could splurge and crumbled some on top! yum! Actually I grew up on iceberg lettuce salads. 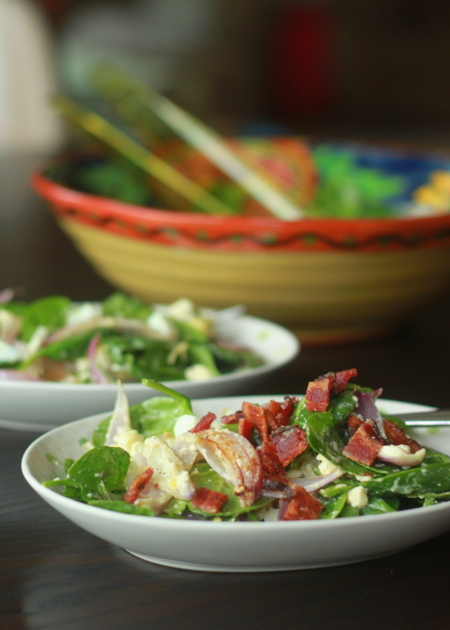 We didn’t eat any wilted spinach salads, but I have had them and loved them. I always thought it was the bacon as well. Thanks for reminding me of this great salad. It looks delicious!